These gluten free energy bars will help power you up with bountiful energy so that you will feel energized throughout the day. Whether you are climbing a mountain or just working through a mountain of laundry, these delicious bars are fortified with the energy you need to make it through your busy, demanding schedule. These make wonderful midafternoon snack when your hungry between lunch and dinner. They are perfect for after a workout or in between classes when you just can't stop for lunch. Be sure you keep these amazing snacks handy—you won't want any other energy bar after trying one Elevate Me! Each Elevate Me bar is packed with real, organic fruits like apples, dates, and cranberries, almonds, and whey protein isolate. All the different ingredients combine to create a wonderful base for each other bars; they are simple, honest, and premium. The fruits, nuts, and protein all bring their own power and energy to the bar to bring you the best, most effective and natural energy for your body. Elevate Me takes care to make sure that the ingredients in their bars are only of the highest quality. The founders are athletes who are very concerned with their health so they make their bars in small batches to ensure that the utmost care is taken with all their bars. You can rest assured that you won't get glutened; all of their products are wheat free. Not only are these bars nutritious, they are also super tasty. They come in an amazing variety of flavors that will satisfy your hunger just as much as they boost your energy levels. From Strawberry Apple Pie to Cocoa Coconut Cluster, these gluten free bars are sure to delight you every time you reach for one. All the different flavors remain all natural, and they taste awesome. The Banana Bread bar tastes like banana bread! The bars that have chocolate are not too sweet. 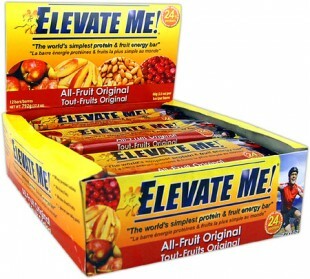 Elevate Me Energy Bars are great gluten free snacks that are sure to satisfy. Enter now to win a FREE variety pack of Elevate Me! Energy Bars! You have from October 28 to November 10, 2013.